One of the best ways to experience the spectacular beauty of New Zealand is to really immerse yourself in the landscape on a multi-day hike. And you don’t have to be an expert hiker – there are plenty of trails suitable for adventurers of all levels. Every year hikers head to the land of the long white cloud to challenge their fitness, get back to nature and experience one of the breathtaking trails that wind through the countryside, around lakes, through sub-tropical rainforests, over glaciers, and up through the snowy peaks of NZ’s mountain ranges. Before you start making plans, there are a couple of things you should know. First, our New Zealand neighbours don’t call it hiking; it’s ‘tramping’ instead. Secondly, there are plenty of adventure companies that specialise in tramping, which takes a lot of the hassle out of organising your trip. If you bring your own good walking shoes, they’ll sort everything else out for you. If you do choose to plan it all out yourself, you’ll need to make sure that you’ve pre-purchased accommodation in the lodges along the trail. Some are operated by private tour companies, but many are operated by the NZ Department of Conservation. Here are three scenic hikes to consider for your next trip, all taking in vastly different types of terrain, but all equally stunning. All are serviced by major tour operators if you’d like a guided hike, or you can bring your own gear and do it yourself. The Milford track is one of the most famous tramps in New Zealand, taking in approximately 50 km around the Milford Sound area. 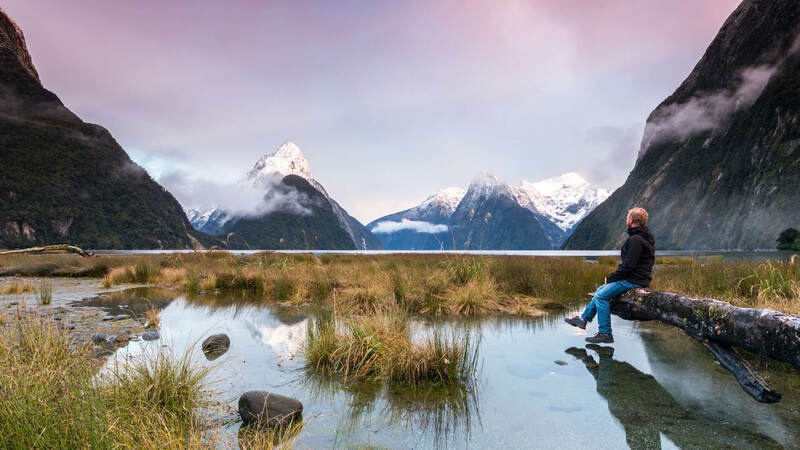 Over fjords carved by glaciers millennia ago and through ancient forests and wetlands, the Milford Track is classified as an easy-intermediate level tramp, and can be walked in four days. The trailhead starts at Te Anau, approximately 2.5 hours drive from Queenstown, and finishes in Milford Sound. Highlights include massive glacier-fed waterfalls and suspension bridges, including NZ’s highest waterfall, the 580 m Sutherland Falls. Note that access is strictly controlled and limited to 90 walkers a day in the summer season, so book early! The Queen Charlotte Track is located at the northern tip of the South Island, winding through the Marlborough region. It’s an accessible track and open year-round, stretching 70 km along the coast. It can be walked in five days or mountain biked in three days. The Queen Charlotte track is well serviced by a variety of private operators for transport and accommodation, and the ubiquitous water taxi services mean that you don’t even have to carry your luggage if you don’t want to – it’ll be ferried straight to your destination for that night. For the adventurous, you can camp at six locations along the track, or pick your level of luxury with one of several private lodges, cabins, backpackers’ hostels or motels along the way. For those pushed for time and after a day tramp, the water taxi services will be more than happy to drop you off and pick you up along a section of the track. The Tongariro Northern Circuit can feel a little bit like you’re hiking an alien landscape. That’s because the track circumnavigates Mount Ngauruhoe, an active volcano located in the middle of the North Island. The circuit can be hiked in three to four days, staying overnight in Department of Conservation huts and campsites – make sure to book these well in advance! On this 41 km Intermediate-grade trail, you’ll hike between craters filled with emerald water and over ancient lava flows. If you’re after an extra sense of achievement and an incredible view, you can choose to hike to the rim of the volcano, which was used as Mount Doom in Peter Jackson’s Lord of the Rings trilogy. Taking on a multi-day hike always requires careful planning for any variables. Make sure your holiday plans are complete with a robust travel insurance policy from Medibank – get a quote today.